The top 1% of your workforce accounts for 10% of organizational output. The top 5% accounts for 25%. It’s no wonder that 66% of organizations report that they purposefully identify high-potential employees. High-potential (or HiPo) programs and initiatives commonly focus on incubating talent that has the potential to succeed in leadership positions. HiPo programs are increasing in popularity; after all, between 50 and 70 percent of organizations feel they are impacted by a shortage of qualified leaders. The quality of leaders doesn’t match the need, and critical roles are not filled because leaders aren’t ready. Many organizations design HiPo programs and initiatives to backfill the sparse leadership pipeline. However, in organizations that intentionally identify HiPo employees, only 24% of senior executives consider the programs to be a success. That’s probably because a whopping 40% of internal job moves made by high-potentials end in failure. Even with HiPo initiatives in place, organizations are 71% more likely to look outside the organization to fill leadership positions. Organizations with HiPo initiatives are still 71% more likely to look outside their organization to fill leadership positions. Why are so many organizations’ HiPo programs and initiatives flat-out failing? The HiPo dilemma may very well be a data dilemma. What does a data-driven HiPo model look like? Often, identifying who should be selected to engage in a HiPo program is a subjective process; managers are expected to identify the “secret sauce” that makes someone a HiPo based on their own "gut feel". The result is a HiPo pipeline filled with talent selected because of their culture fit, or because of their high-performance as an individual contributor. And just because someone is a fantastic individual contributor does not mean they’ll be a good leader. That’s because leadership positions require a whole new set of competencies than individual contributor roles. High-performing individual contributors get pushed into HiPo programs based on their past results, and not based on their future potential. High-performing individual contributors get pushed into HiPo programs based on their past results, and not based on their future potential. There are models out there that measure leadership potential; Korn Ferry, for instance, outlines “Seven Signposts” that identify high-potential leaders, which include traits like self-awareness, drive, and reasoning. Korn Ferry (and other institutions) have identified learning agility — or the ability to learn from experience — as the key indicator of high-potential globally. In order to avoid falling into the trap of treating these models subjectively — i.e., selecting high-potentials by sitting down in a boardroom and saying, “I believe so-and-so has high learning agility” — organizations have hired the consultants that have developed these models to perform psychometric tests within the organization to identify individuals who exemplify the markers of high-potential. The non-scalable and expensive nature of this process, however, has meant that it's been reserved for senior managers and above. The advent of software-based psychometric assessments, escalated by the introduction of AI, has removed a lot of these barriers, allowing the expertise of data-driven selection — facilitated by psychometric tests — to be far more accessible for many organizations. Although organizations are beginning to introduce psychometric assessments into their hiring process, many are not seeing the potential of these predictive selection methods into other facets of talent management — including HiPo selection. Psychometric assessments are able to measure the HiPo “secret sauce” — talents like learning agility, drive, and resilience. A data-driven approach to HiPo initiatives moves beyond subjective selection and instead quantifies individuals’ HiPo dimensions. Additionally, instead of throwing away this data after a single-use case, data-driven organizations could greatly benefit from storing these datasets, leveraging them to make other talent decisions, such as promotions, professional development, and career pathing. There are a lot of other benefits that organizations can garner from implementing a data-driven approach to HiPo programs and initiatives. As mentioned earlier, the introduction of software-based psychometric assessments allows these tests to be distributed at a scale that was not possible with a consultant. Now, you no longer have to reserve HiPo identification to a select few senior managers and above; you can measure leadership potential in every single employee. When high-potentials are identified for future potential, and not past results, individuals no longer need to complete a long tenure at a company to be considered for a HiPo program. Suddenly, much younger talent can be considered for selection into your emerging leader pipeline. And that’s only going to help you retain young talent that have a lot of leadership potential; after all, high-capacity individuals need challenging work to feel fulfilled in their jobs, otherwise they’ll churn. And Millennial talent are the most likely generation to switch jobs; Gallup found that six in 10 Millennials are open to new job opportunities. If your young talent has high leadership capacity but isn’t able to operate in that capacity at your organization, they’ll likely leave. Not only does engaging young, high-potential talent benefit you as an organization by retaining said talent, but it also opens up your leadership pipeline to an otherwise untapped talent pool. A subjective approach to high-potential selection is fraught with bias. The Harvard Business Review found that one of the top characteristics for which organizations were selecting high-potentials was how well they fit in the culture of the organization. Selecting individuals based on “culture fit” perpetuates a “just like us” mindset, and disregards marginalized groups, skewing the leadership pipeline selection process to favor privileged groups. A data-driven approach to HiPo selection can help remove these barriers by quantifying performance potential instead. It’s in your organization’s best interest to build a leadership pipeline with more diverse perspectives and backgrounds. McKinsey found that organizations in the top quartile for gender diversity are 15% more likely to have financial returns above their respective national industry medians. For racial diversity, it’s 35%. Pinterest learned that they were only able to attract more women engineers by putting more women in engineering leadership positions. Clearly, diversity has a trickle-down effect. It's in your organization's best interests to fill your leadership pipeline with diverse talent; after all, diversity has a trickle-down effect. 24% of organizations aren’t measuring the effect of HiPo programs on promotion rates, and 21% aren’t even measuring the impact on retention. It’s no wonder that so many companies feel like they are in the dark about the effectiveness of their HiPo initiatives. It’s not an earth-shattering fact that objective data is a lot easier to track and measure than a subjective approach to HiPo programs. And when you can plug that data directly into your HCM, you can measure the effectiveness of your HiPo program up against promotion and retention rates. Although there are software services and databases for every other facet of talent management (learning & development, applicant tracking, etc. ), there doesn’t seem to be any software out there that collects and tracks HiPo data. As a result, many organizations assume there are only two approaches to HiPo selection — consultants, or “gut feel.” We propose that there is a third option, one that is scalable, trackable, and promotes diversity — a data-driven approach to HiPo selection. 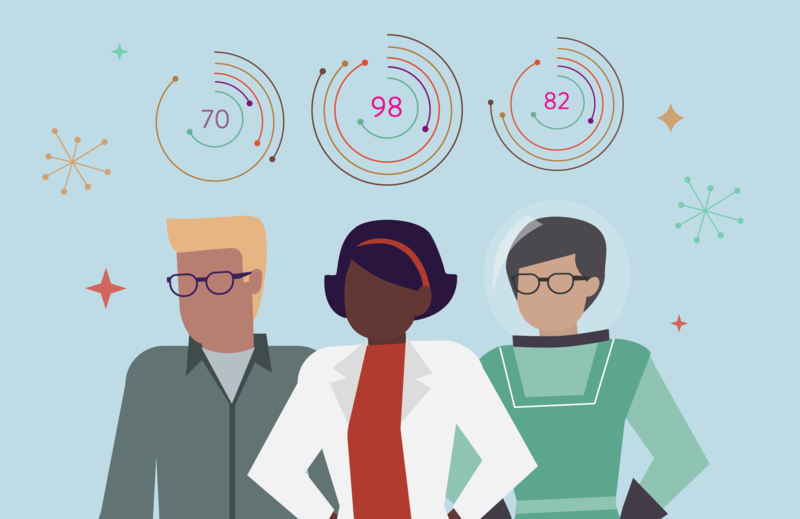 A data-driven approach to HiPo programs and initiatives takes models already developed by research groups like Korn Ferry and Deloitte — models that have the science to back up their validity in selecting leadership potential — and uses software and AI to scale and democratize the psychometric tests that quantify traits like learning agility. Plum has aggregated the research, and has been able to distill the traits that make an emerging leader into 6 dimensions: drive, presence, learning agility, empowerment, self-confidence, and resilience. To learn more about a data-driven approach to HiPo programs and initiatives, and how Plum quantifies the HiPo dimensions, check out our Identifying Emerging Leaders page.